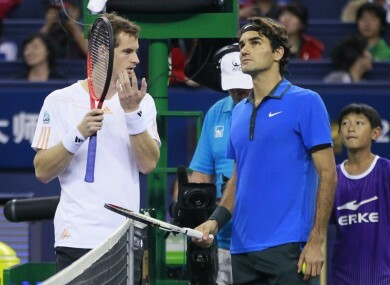 Andy Murray and Roger Federer discuss rain drops. DOMINANT ANDY MURRAY outmuscled Roger Federer in the Shanghai Masters, taking advantage of a service meltdown by the Swiss great to set up a repeat of the US Open final against Novak Djokovic. The US Open champion, who has never been beaten at the event, won 6-4, 6-4 in a display of controlled aggression, repeating his victory in the Olympic final that came after the searing pain of defeat to Federer at Wimbledon. The pair swapped breaks at the start of the match but the first set hinged on an incredible fifth game when 17-time Grand Slam champion Federer was broken to love after the normally ice-cool Swiss double-faulted three times in a row. “He didn’t serve that well for him tonight so I was able to be very aggressive on his second serve,” said British third seed Murray, adding it was always special to beat Federer, rated as one of the all-time greats. After taking the first set Murray, who won the Shanghai Masters in 2010 and 2011, immediately put the world number one under the cosh at the start of the second set but the Swiss dug deep to save seven break points and edge ahead. But Federer, 31, continued to struggle and it was the fifth game of the second set that again proved pivotal, with the 25-year-old Scot sealing a break against the Swiss, who had led 40-0, with a devastating forehand return winner. Murray faced an agonising wait of more than half an hour to serve for the match as the magnolia-shaped roof at the Qi Zhong Stadium was closed after it started raining and an army of people dried the court. The players left the court and had to knock up again on their return but Murray kept his nerve to serve out for victory, sealing the match when Federer netted. Earlier, in-form Djokovic accelerated his push for the year-end number one ranking, dismissing the challenge of fourth seed Tomas Berdych 6-3, 6-4 in a one-sided match and set up a finals duel with Murray. The Serbian leads Murray 8-7 in head-to-heads ahead of Sunday’s final. Their last meeting was in the US Open final in New York, which Murray won in five sets to win his first Grand Slam. Email “Murray conjures up Olympics repeat to derail the Fed Express”. Feedback on “Murray conjures up Olympics repeat to derail the Fed Express”.